GPSC Nayab Mamlatdar Recruitment 2018 notification is liberated out by the GPSC officials. The details mentioned here is related to the 412 Deputy Section Officer, Deputy Mamlatdar Vacancy filling process. On 15th Sep 2018, Gujarat PSC Dy So Application Form is active and it is available till 1st Oct 2018. 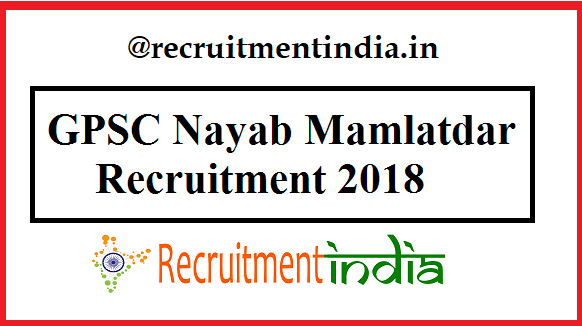 For the intimation related to these GPSC Nayab Mamlatdar Recruitment 2018 details, we are have posted this page. The information that is addressed here is related to the eligibility, selection process, salary details etc. Any eligible and interested candidates should apply for this GPSC Dy So Recruitment from 15th Sep to 1st Oct 2018. GPSC Deputy Mamlatdar Recruitment 2018 status has made into the active state of the recruitment process. So now the candidates, have not the necessity to wait for the release of the notification since it has released now. Now we have to keep following this update to know how to select in this Gujarat State Govt jobs. Our page coveys the very detailed information, particularly about the GPSC Nayab Mamlatdar Recruitment 2018 details. For the successful completion of the application form, you must approach these details and attain the eligibility from the side of GPSC board to participate in this GPSC Recruitment. In every state, there have many Government departments like Revenue Department, Secretariate, Legislature, Gujarat Public Service Commission. Similarly, in Gujarat State also all these departments are available. At present in these departments, there have the GPSC Deputy Section Officer Vacancy. This part of the vacancy filling process is given to the GPSC board. Hence GPSC board uploads the GPSC Nayab Mamlatdar Recruitment advertisement in the respective official site stating about the Nayab Mamlatdar Eligibility, Dy So Educational qualifications, salary details and application form active dates are 15th Sep to 1st Oct 2018. To get the confirmation over all these points, just look at the below given GPSC Dy So Recruitment. GPSC Nayab Mamlatdar Eligibility is Bachelor’s degree from a recognized university or Board. For these GPSC Deputy Section Officer and Deputy Mamlatdar Vacancy, the selection process is as below. For all category applicants, the fees details are given in the official GPSC Notification. Rs.100 + Banking Charges should be paid by the applicant in the form of application fees. In Gujarat, 412 Deputy Section Officer(Dy So), Deputy Mamlatdar (Nayab Mamlatdar) Vacancy have to be filled by the GPSC board with the eligible candidates. Contenders, who fulfil the eligibility norms of your willing post they only suitable to complete the formalities of the application form. If anyone does the GPSC Deputy Mamlatdar Recruitment form submission without meeting the eligibility criteria, then that form is of no use as the officials will not give the permission to participate in the exam to the individuals who are violating the rules of GPSC that are mentioned in the Gujarat PSC 412 Vacancy Notification. Fill the GPSC Deputy Section Officer Application Form which has started from 15th Sep to 1st Oct 2018. Only within these dates, only candidates are legal to forward the application form. Except for these dates, postulants cannot make the enrollment process. So applicants after acquiring the clarity over the guidelines of the GPSC Nayab Mamlatdar Recruitment 2018 process, candidates move to the step of the application process. If any doubts raised during the GPSC Deputy Mamlatdar Online Form filling, then contact the officials or Recruitmentindia.in page. We will try to put the maximum effort to clarify your doubts. And the syllabus to appear for this written exam also given here.